Accumulation curves for nitrogen (Naccum), phosphorus (Paccum), and potassium (Kaccum) obtained from total dry biomass (W) can be employed for the prognosis of potato production in the Andean region, along with analysis of nutrient partitioning derived from the nutrient harvest index (NHI, PHI, KHI). 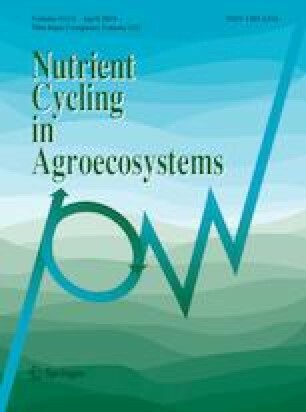 This research established accumulation curves and translocation curves for N, P, and K using allometric relationships in the potato cultivars Diacol Capiro and Pastusa Suprema (Solanum tuberosum, group Andigenum), cultivated in soils with high and low fertility. The best fit of the accumulation model was obtained with the low fertility soils for the ‘Supremaʼ (Naccum = 68.13W0.504, Paccum = 6.724W0.779, and Kaccum = 63.93W0.776), which expressed the highest production potential and high values of NHI (0.55–0.69), PHI (0.75–0.8) and KHI (0.62). The ‘Capiro’ was better adapted to the changes in soil fertility than the ‘Supremaʼ since the models for nutrient accumulation in the ‘Capiro’ were significant for both levels of soil fertility. The efficiency of N, P, and K translocation into tubers followed a positive logarithmic model, which showed differences in favor of the ‘Capiro’ in the translocation efficiency of mineral nutrients. The accumulation of N, P, and K was established per cultivar and per phenological stage of growth, with up to 33% more P extracted by tubers in the ‘Capiro’ than in the ‘Supremaʼ and a comparable extraction of N and K by tubers in both cultivars. The authors are grateful for the help of the Faculty of Agricultural Sciences, National University of Colombia in developing this research. We acknowledge the valuable support of Ingeplant SAS and Fedepapa (Colombia) for funding and laboratory analysis. The authors express their gratitude to research assistants Mrs. Paola Torres, Mrs. Liliana Arevalo, Mr. Elías Silva, and Mrs. Andrea Barragán for help in the field. We also thank the growers Mr. Walter Guzmán of Biogenética, Mr. Yovanny Pulido, and Mr. Ricardo Rojas for providing logistic service to this research. The authors thank Mr. Johan Urquijo for his help with data analysis.